The Leveller takes place in the not so distant future where everyone can enter a virtual reality world called the MEEP. The MEEP allows you to build whatever kind of world you want. It comes as no surprise that people start getting addicted to these made up worlds. It is Nixy’s, off the books, job to enter the MEEP and drag out kids who have been gaming a little too long. When the MEEP creator’s son goes missing he hires Nixy to get Wyn back. The problem is Wyn isn’t just gaming, someone has trapped him in the MEEP and Nixy and Wyn must ban together to escape. I really loved the setting of this novel. It begins in the real world but quickly Nixy is drawn in to Wyn’s virtual reality world. Wyn has created the 1950’s Cuba his grandmother lways told him about, complete with Ernest Hemingway. The constantly shifting MEEP setting was my favorite part of this novel. Durango really shined with her world building skills. The romance in this novel left something to be desired. It felt too formulaic and expected. There was also a lot of slang use that it made it feel like the characters were making jokes that I wasn’t in on. It really detracted from the reading. 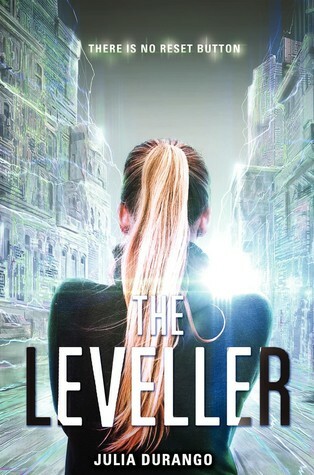 Overall, despite my few issues with the novel The Leveller was a quick, fast paced, read with a fun premise. I liked the ever shifting setting and the MEEP. I think there is a lot of promise in this new series!